Irene Theunissen, 99, died Friday, Jan. 25, 2019 at her home southwest of Hoven. Mass of Christian Burial was held Tuesday, Jan. 29 at St. Anthony’s Catholic Church, Hoven, with Father Kevin Doyle, Celebrant. Interment followed at the Church Cemetery. Irene Agnes Nothaus, daughter of Anna (Peppenhorst) and Bernard Nothaus, was born April 13, 1919 at Salem, Missouri. She was brought up near Salem and attended rural school. Following her schooling, she was employed at a garment factory in Salem. Irene married Theodore Theunissen at Salem on June 1, 1949. They made their home on Ted’s farm four miles south and two miles west of Hoven. Ted died Feb. 19, 2002 and Irene continued living on the farm the rest of her life. 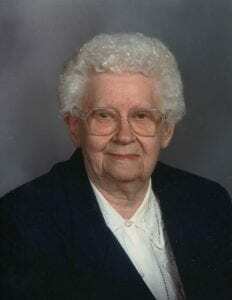 Irene was a member of St. Anthony’s Catholic Church in Hoven. She enjoyed canning and tending to her garden and orchard. Irene will be remembered for taking good care of her family. Irene is survived by two sons—Edward Theunissen and Donald Theunissen of Hoven; one daughter, Mary Ann (Steve) Pirner of Pierre; and two grandsons—Zane Pirner of Pierre and Jeremy Pirner of Norfolk, NE. In addition to Ted, Irene was preceded in death by her parents, three sisters (Helen Hughes, Ann Hollenkamp, and Mathilda Nothaus), two brothers (Louis and Albert Nothaus), one son (Daniel) and an infant grandson (Zachary).